Some of you may not believe it but our friends Franck Ibanez (French) and his wife Wang Meng Ngee (Singaporean) have been living on a sailboat since 2002. Now their boat is docked at Raffles Marina where they raise two beautiful daughters, named Carmen (2.5 years old) and Julie (1 year old next week). Actually, this was our first time visiting them on Constante Oslo, a 26 year old Alpa (an Italian-made sailboat) with a total length of 41 feet (12.5 meters) and two masts (ketch). I bet you wonder what they do for a living, don't you? Frank takes care of Simpson Marine's service department and Meng is plays double bass for the Singapore Symphony Orchestra . So between sailing and music, they are living in perfect harmony. *Channel News Asia did a piece on them back in 2005 if you are interested to read it:Singaporean woman and family live life on the seas. And what did I learn from this visit? A lot! Franck really opened up the way I see sailing life. Living on a boat is a lifestyle that many have adopted. In fact, you can visit Living on Boats to learn more about it. You can buy a used 35 or 40-foot sailboat for under S$150,000 complete with, well, two sails and a mast, two bedrooms (staterooms), kitchen (galley), living room and a small built-in (inboard) engine to help you manuevre through the harbor. Once you have bought one, you will then have to dock it somewhere with utilities connection such as fresh water and electricity. In fact, Simpson Marine has a complete list of second-hand sailboats to choose from. One thing, though, that you have to keep in mind is that a boat requires 100% committment from you as the owner (and skipper). At least once a week you have get down underwater to inspect and clean (if necessary). All in all, when you have a boat in tip-top condition, you could then sail anywhere anytime! For most people the boat becomes a part of you (and your family). Franck grew up with a boat all his life. God knows how many years he's been in marine business. I guess it's all in his blood. His parents (Emile and Anne) travelled around the world on a sailboat for 6 years using a boat that they built themselves! They had written a book about it and I was fascinated when Franck read it out loud to me in English. I myself have been dreaming of sailing for a long time and together with Rani we have been dreaming of owning a sailboat, too so that we could take tourists to different islands of Indonesia. For that, Franck suggested we get at least a 34-foot second-hand keelboat or a catamaran to start with when we have the money. Sounds like a good idea! But we must wait a while until we have enough coins to afford it. Nevertheless, Noe seems ready to sail! Perhaps it is now a good time to pick up something new. Sailing a cruiser sailboat like what Franck has is probably too early for me now. So how about a dinghy? Well, the good thing about Singapore is that you could take basic sailing lessons using a simple sailboat like the Laser for a reasonable cost. You don't have to own the boat if you know where to rent it. If you are interested in sailing, come join me! My friend Akhmad Faqih and I are signing up a 3-day lesson on 11, 18 and 25 March at the Pasir Ris Sea Sports Club. At S$330, it is definitely not cheap but definitely more afforadable than what they offer in other facilities. The sailboats we will use are called Laser. These models are lightweight and fast! They are used for Olympic competitions, too! After the basic laser sailing, I plan to take keelboat competent crew lesson. The lesson will allow me to volunteer to be a weekend crew for large saiboats like this beautiful Beneteau 40. Sounds like a plan, doesn't it? Later at 7:00pm in the evening, we went to have a cookout with Ari, Thalia and Koda at their lovely home. We have marinated two whole chickens Yucatecan style! Rani also made corn tortilla from scratch accompanied with home made salsa. It was a marvelous dinner indeed! The chicken was cooked for 1 hour on a Webber grill making it very succulent and juicy at the same time. Let's do it again soon! 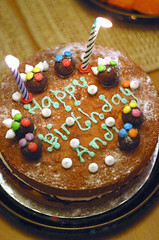 BTW the day before we celebrated Andika's second birthday at Natasha's place. Happy birthday Andi! wow, what a day. and Noe has one hell of a stamina, considering how active and jumpy he was later that night, even after the swimming lesson and trip to the boat. good, healthy Noe. yay! Going to take a trip… cruises are most fun and the views are great. I came across your blog by complete coincidence. My husband and I know Franck and Meng who live in Raffles Marina with their two girls. In March 2007, we were passing by Singapore in our 34' sailing yacht called Scot Free II on route from Thailand to Australia. We were moored in Raffles Marina twice, 2 weeks each time. We had the pleasure of knowing Franck and Meng, we were even invited to see Meng perform at the SSO. They were in preparation for their long journey to France via South Africa, brave people. I understand they have left Singapore last Oct and we had a lovely message from them while they were in Similan Island (I think) a few months back after my baby daughter was born. Have you been in touch with them? It would be great to get in touch with them again. We know how difficult to have internet access whilst doing long ocean passages. Just thought it was interesting to read someelse's blog who knew Franck and Meng ! There is a picture of us with Franck & Meng in the photo gallery. Hi i was just looking for swimming and boating keywords and got your blog link too . Even i love boating and so i went through whole post but images you have pasted in your post hosted on flickr are not available . . Please do check them . In March 2007, we were passing by Singapore in our 34' sailing yacht called Scot Free II on route from Thailand to Australia in http://www.bungiesucks.com/. We were moored in Raffles Marina twice, 2 weeks each time.